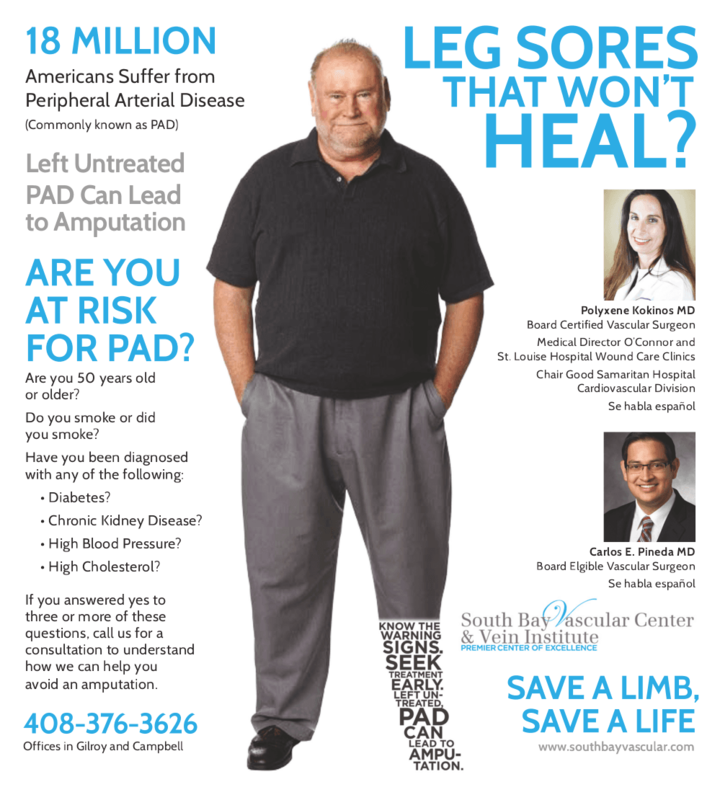 South Bay Vascular Center and Vein Institute is pleased to announce the launching of our new Amputation Prevention and Limb Salvage campaign. Keep an eye out for one of our new ads throughout San Jose and the South Bay. Dr's. Kokinos and Pineda are at the forefront of research, development and treatments in the speciality of limb preservation. Our new campaign is designed to help patients facing the threat of lower limb amputation understand that there may still be hope for keeping these limbs. 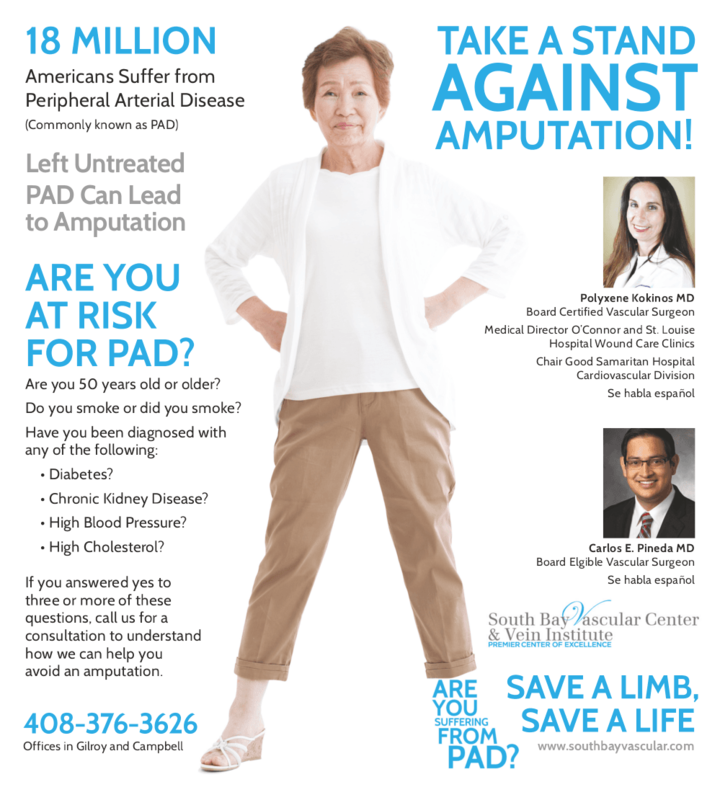 Recent advances in both imaging and medical device technology have entirely changed the field of limb preservation and have enabled vascular surgeons to help patients suffering from these problems in ways that were not available 3 years ago. 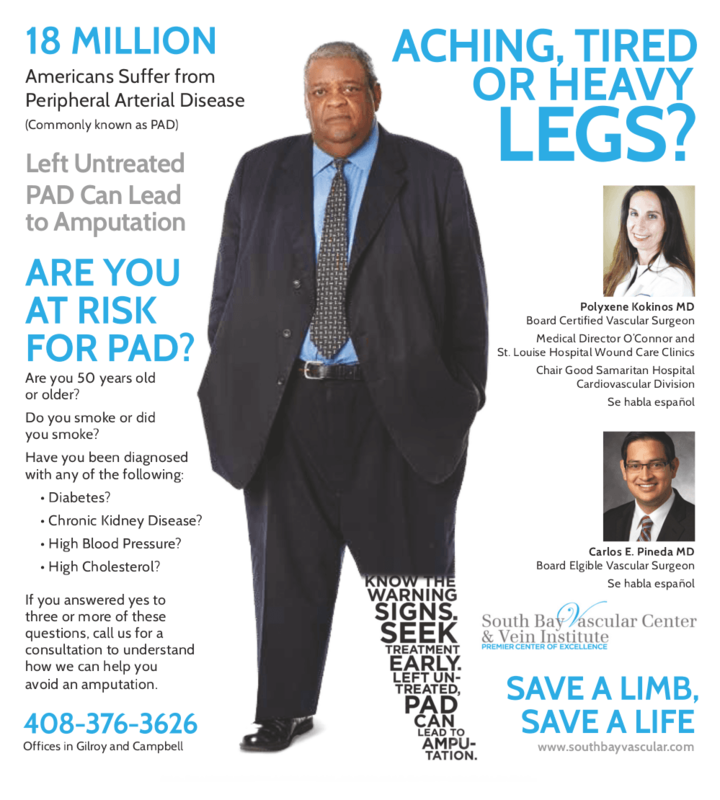 As leaders in the field of limb preservation, Dr's Kokinos and Pineda specialize in the treatment of lower extremity limb preservation and in the diagnosis and treatment of Peripheral Arterial Disease (PAD) and Chronic Limb Ischemia (CLI). Newly developed minimally invasive surgical techniques are helping patients save limbs by re-establishing blood flow to these impacted areas in ways that were just not possible in the past. Many of these surgeries can now be done in our state of the art angiography suite without the need for patients to be hospitalized and which enable patients to return home the same day of their procedures. Patients facing a potential lower limb amputation are encouraged to call our office to understand how these new technologies may offer them hope when other say there is none. If you or your loved ones know anyone facing the possibility of an amputation, STOP! Call our office for a consultation on how we can help. We look forward to continuing to serve the south bay community and to help our patients "Get Back Their Life"
Please call us at 408-376-3626 to schedule an appointment and to see how we can help. We've included copies of our new add campaign and hope they help to spread the word on how we can help. Take a look!